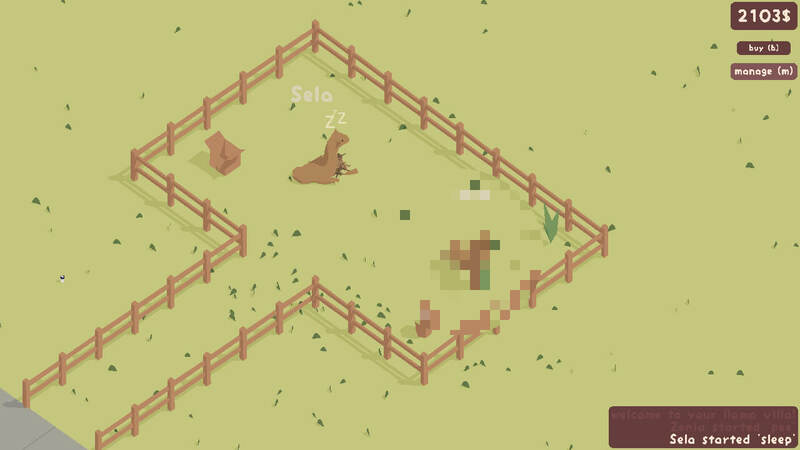 Do you want to open your own little llama farm, with some furry friends in a large field? I sure wanted too. 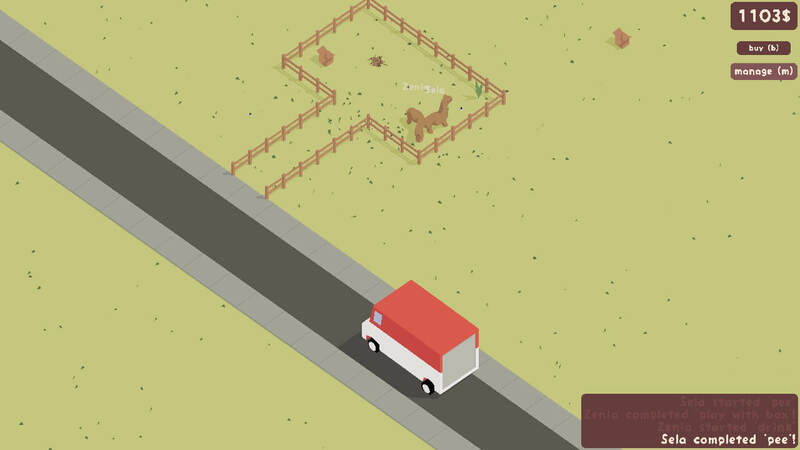 I started out with just one llama in a gated area, but she seemed quite… lonely. I quickly picked up a second llama and a bunch of essentials for them: a sprinkler to shower in, a box to play in, a bucket of water to drink from, and some hay for them to make nests out of to sleep. They could do their business in the grass nearby as well. Sela sleeps on her nest while Zenia uses the bathroom. And here we are! 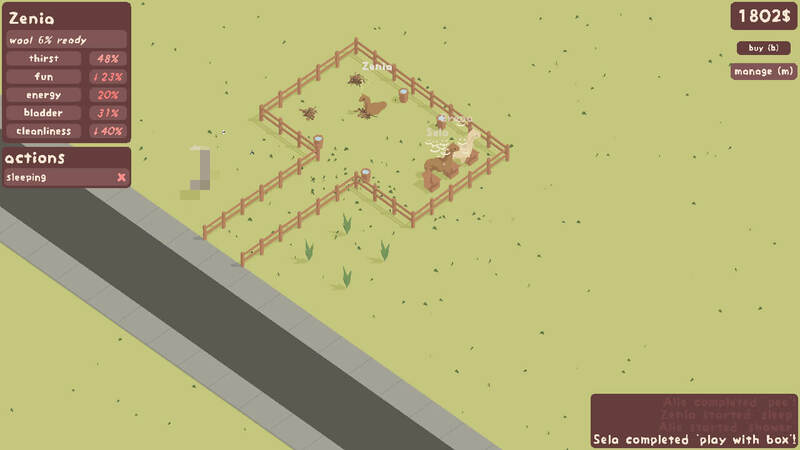 I have my own little llama farm – not quite a Llama Villa, but it looks good enough to me. Everyone seems happy enough. They wander around, do what they need to do, and occasionally I shear them — both for profit and their own comfort. I went on with my morning, making some ramen for myself while these two played. They seemed to be enjoying their little plot of land, but soon wanted another new friend. A red truck brings new friends! A truck came and bam! We had two new llamas — these ones completely different in color to the previous two. They definitely needed more items to keep them all happy — so that they could have more room and be able to make their needs happen easily. I also decided to keep the enclosed area as a sort of bedroom, with a water bucket. This seemed to do well for them. After a few shavings I went back to my life once again, answering emails while they continued to stroll around and enjoy their natural place. Home re-decoration to accommodate the new friends. It seemed like, after a while, this lifestyle isn’t what my new friends wanted. They craved something more like where I, clearly also a llama in their eyes, lived. This is a game called Llama Villa, after all. I didn’t think much of it, but they kept needing more and were unsatisfied with the world around them. 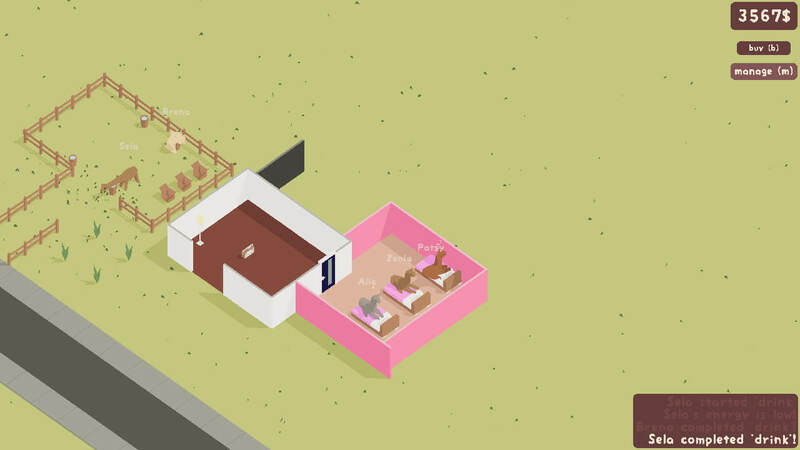 So, like any good caretaker, I started building a house. I expected them to see that these houses were for humans, not so much creatures. But then, I made the mistake of putting in beds. Yes, this is the shape they wanted their house to be. They invited over a new friend and… well. They found beds to be far better than nests. I know that they knew I was making quite a bit of dough from shearing and selling their wool — and they knew this money could be used to expand their living arrangements. They started making requests: computers, a kitchen, a place to shower that had hot water. These seemed pretty reasonable, so I continued to build under their guidance. I do want my little buddies to be happy. They really seem to be enjoying this human home. They really started enjoying their home — leaving sometimes for long strolls before returning back to enjoy all of the features a full, human house has. With a few more decorative additions to the wonky structure and colors, they were quite… happy. Look at all those happy faces. I’m pretty sure these llamas think they are humans now. They spend a lot of time listening to the radio and napping. One of them, Patsy, is particularly fond of drinking smoothies. They don’t even really need me now, with their very full lives of enjoying these modern luxuries. Good thing too, as I never quite finished clearing out my inbox. You can pick up Llama Villa for $3.00.